Top row, from left: National chief Anthony Peluso and national vice chief Michael Kipp. Bottom row, from left: Northeast Region chief Justin St. Louis, Southern Region chief Zach Callicutt, Central Region chief Will Coots and Western Region chief Jordan Jefferis. Anthony Peluso, an Eagle Scout and Vigil Honor OA member from Virginia Beach, Va., has been elected 2018 national chief of the Order of the Arrow. In late December each year, OA section chiefs from across the nation gather to plan the following year’s calendar. But before they can do that, they must elect a national chief, national vice chief and region chiefs. The elections usually start around 7:30 p.m. and don’t end until late into the night. Anthony’s election was made official on the OA Facebook page at 11:02 p.m. National vice chief Michael Kipp’s election was announced more than two hours later, at 1:04 a.m.
As national chief, Anthony represents nearly 200,000 Arrowmen — youth and adult members of the OA — throughout the 2018 calendar year. Anthony joins 2017-18 National Venturing President Michelle Merritt and 2017-18 National Sea Scout Boatswain Mercedes Matlock as the three highest-ranking youth leaders in the Boy Scouts of America. These three youth leaders sit on the BSA’s National Executive Board, helping shape the future of our great movement. 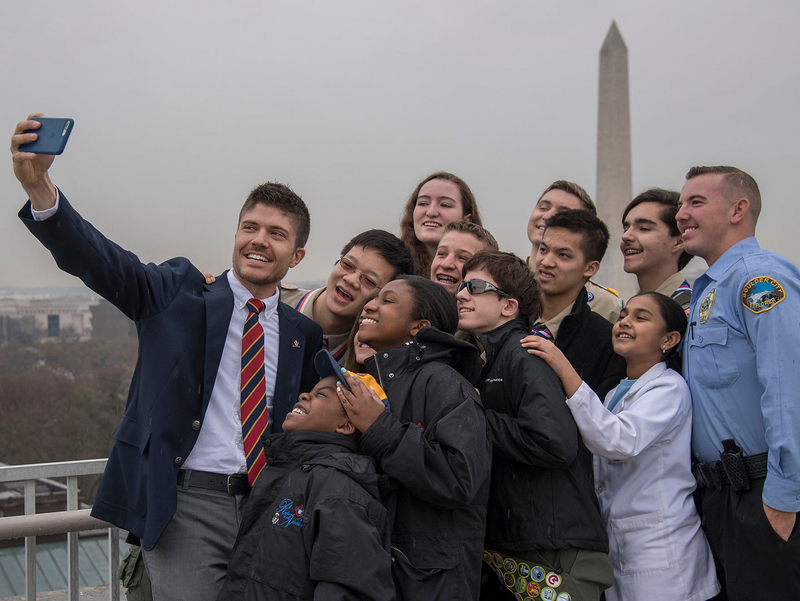 As one of his first acts, Anthony will join Michelle, Mercedes and a group of other impressive Scouts and Venturers at the BSA’s Report to the Nation in February in Washington, D.C.
After that, Anthony will lead the OA at the 2018 National Order of the Arrow Conference. The OA’s most high-profile event, NOAC is held every two or three years. Registration is open now for NOAC 2018, held July 30 to Aug. 4 at Indiana University. Scouting background: Eagle Scout, Vigil Honor member of Blue Heron Lodge (Tidewater Council). Served as section chief for SR-7A. Recipient of the Founder’s Award. Education: Economics major at Virginia Tech; plans to attend law school after graduation. Hobbies: Intramural sports, singing and fantasy football. Fun fact: He once ate 10 hamburgers in one sitting. Scouting background: Eagle Scout, Vigil Honor member of Sakima Lodge (LaSalle Council). Served as section chief for C-6A. Recipient of the Founder’s Award. Education: Strategy and organizational management major at Purdue University; plans to pursue a career in human resources management. Hobbies: Hiking, working on summer camp staff and getting involved on campus. Fun fact: He is his lodge’s first national officer. Scouting background: Eagle Scout, Vigil Honor member of Wulapeju Lodge (Blackhawk Area Council). Served as section chief for C-7. Recipient of the Centurion Award. Education: American studies and political science double major from the University of Notre Dame; plans to pursue public service and research following his graduation. Hobbies: Watching The West Wing, listening to jazz music, playing football and hiking. Scouting background: Eagle Scout, Vigil Honor member of Pennacook Lodge (Spirit of Adventure Council). Served two terms as section chief for NE-1. Recipient of the Founder’s Award. Education: Political science major at the University of Massachusetts, Lowell; plans to attend law school following his graduation. Fun fact: Over the past four years, he has participated in a 3-mile swim across Northwood Lake in New Hampshire to fundraise for local Scouting programs. Scouting background: Eagle Scout, Vigil Honor member of Chicksa Lodge (Yocona Area Council). Served as section chief for SR-6. Recipient of the Founder’s Award and James E. West Award. Education: Public policy leadership major at the University of Mississippi; plans to attend law school following his graduation. Hobbies: Golf, sailing and duck hunting. Fun fact: He learned how to water ski when he was 8 years old. Scouting background: Eagle Scout, Vigil Honor member of Wauna La Mon’tay Lodge (Cascade Pacific Council). Served as section chief for W-1S. Education: Homeland security major at Concordia University; plans to attend law school following his graduation. Hobbies: Watching The Good Wife, golfing and traveling. Fun fact: He loves coffee and wants to open a coffee shop when he retires. Hat tip: Thanks to Michael Swalberg, OA Communications Coordinator, for the info and photos.